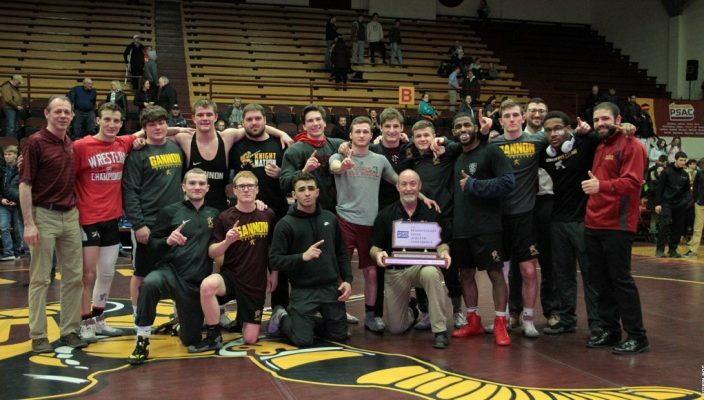 The 21st-ranked Gannon University men’s wrestling team faced crosstown rival Mercyhurst Wednesday night at the Hammermill Center, and the Knights pulled out a narrow 19-18 win to capture a piece of the Pennsylvania State Athletic Conference dual championship. Gannon won five of the 10 bouts and also collected two bonus-point victories at 125 and 141 pounds. This led to Gannon finishing the season at 7-3 overall and 6-1 in the conference, tying with Pitt-Johnstown and Kutztown for the championship. It was also senior night and four seniors were honored for their hard work and dedication to the team: George McGuire, Teagan O’Sullivan, Casey Vollmer and Luke Walter. Sophomore Jacob Dunlop (125) gave Gannon an early lead by winning a 12-4 major decision over Jacob Ruggeri. Dunlop finished the dual meet season with 16 wins and nine major decisions, which are both team-bests. Three Knights – Joel Leise (174), Faris Messai (149) and Freddie Nixon (197) — won by decisions. Leise, a redshirt freshman, defeated Trevor Johnson, 6-2. Messai, a redshirt sophomore, narrowly recorded his 11th win by edging Mike Clark, 4-3. Nixon, a sophomore, earned his 15th win of the season, 10-3, over Brenden Calvin. Freshman Nick Young (141) won his match over Jeff Sisk with a pin at 2 minutes, 42 seconds. This was Young’s fourth pin of the year. Austin Hertel (133), McGuire (157), Connor Day (165), Anthony Williamson (184) and Gehrig Hutchison (285) all fell to their respective opponents. Hutchison had to avoid being pinned in order for Gannon to lock up the win, and he was up against Jacob Robb, the nation’s sixth-ranked wrestler. Robb posted a 9-0 major decision, but the four points were not enough to vault the Lakers past the Knights. Gannon will next see action at the NCAA DII Super Region One meet on Saturday at Mercyhurst. Eight Knights are currently featured in the regional rankings. McGuire is currently ranked No. 1 in Super Region One and No. 5 in NCAA Division II. Nixon isn’t too far behind, ranked at No. 3 for the Super Region One. Dunlop and Hertel are currently both ranked fourth, while Young, Day, Leise and Williamson are all ranked at No. 6. Young was named the PSAC wrestler of the week Monday, marking the third time this season that a Gannon wrestler has taken home the honor. Young has an overall 13-11 record and finished with a 5-1 mark in dual meets. Earlier wrestler of the week winners were Dunlop and Leise.